I realize that talking about Tyrannosaurus rex needs no further justification for most people (and what the heck is wrong with the rest of you, anyway? ), but I just so happen to have such justification - The Tyrannosaurus rex skeletal and painting I did for Permia’s latest line of shirts & sweatshirts. I should note straight away that all of these designs for Permia have a few constraints on them - they should (naturally) be posed in a way that is visually interesting while retaining scientific accuracy, and they need to fit into a t-shirt friendly aspect ratio that is frankly quite a bit taller than the average dinosaur in side view (this was a particular challenge while working on the armored dinosaur Euoplocephalus). I knew that I needed to get the T. rex into more of a vertical orientation than normal, and my first thought went to the (in? )famous T. rex mount in the Denver Museum of Nature and Science. When the mount first went up it was seen as pushing the boundaries of what a reasonable interpretation of tyrannosaur movement was like. For this reason it was referred to (not always in a complementary fashion) as the dancing rex mount, the ballerina rex, and the Rockette rex (after the famous Radio City Rockettes - though to be fair the DMNS mount isn’t getting its leg up anywhere near high enough to join a chorus line). Note that I did not adopt the DMNS ‘rex pose per se - I was working without reference while trying out poses. 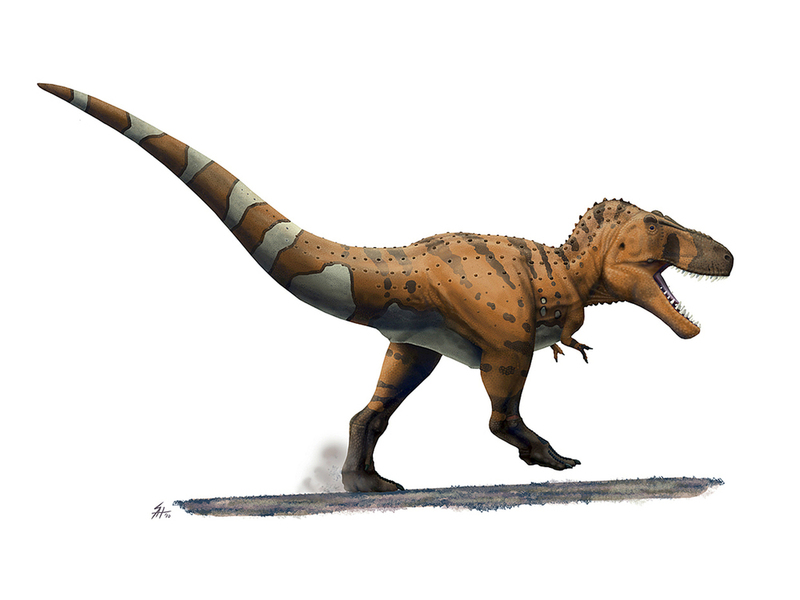 But the need to create a more upright, yet dynamically posed Tyrannosaurus resulted in similar choices. So should this new pose still be controversial? A lot has changed in the decades since the DMNS mount went up - dinosaurs, even those as large as T. rex are not seen as being clumsy sluggards. Any biped that can walk has to be able to stand on one leg, if only for a while. Of course there are several differences as well - I wanted a pose that didn’t violate the knee articulations, and I also didn’t end up making the Permia ‘rex rear up nearly as vertically along the vertebral column. Of course some other things that have changed significantly in the last few decades is the knowledge that epidermal insulation was widespread among coelurosaurs (if not most dinosaurs…or even ornithodirans). 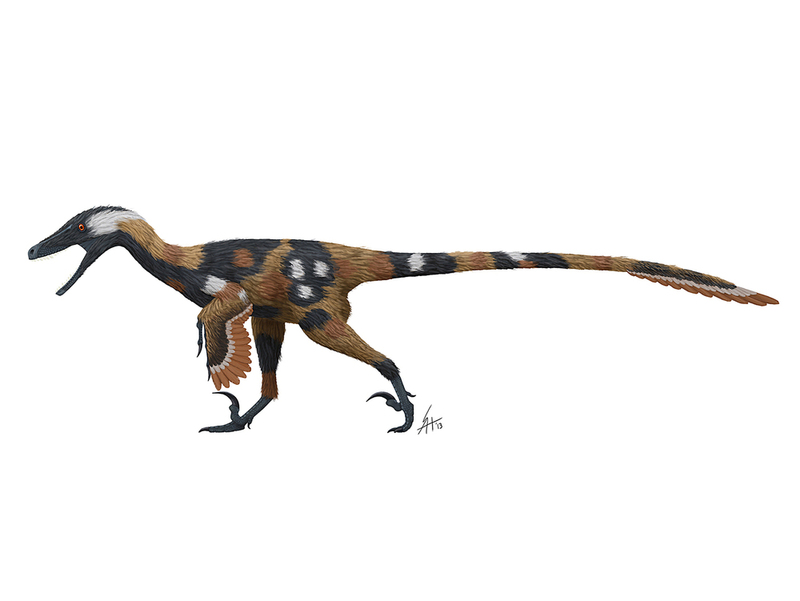 Much has been made recently of the issue of feathers on the largest tyrannosaurs. While it’s clear that more smaller, more primitive tyrannosaurs such as Dilong and Yutyrannus did indeed have fur or feather-like epidermal structures, the issue is less clear in Tyrannosaurus rex. Recent papers have highlighted the fact that scales are known for several portions of the neck, limbs, and tail of T. rex, and preliminary work done by myself and others at UW-Madison have also cast some aspersion on the idea of fully-feathered giants. This has lead several paleo-artists to reverse course and put scales on their Tyrannosaurus models and/or illustrations. This is entirely defensible - and may ultimately prove correct. But as noted by others (including Earth Archives), we don’t have any comprehensive preservation of T. rex skin patches, just bits and pieces. And a partial covering (especially one that protects the back from absorbing direct sunlight as rapidly) isn’t precluded by the physiological models I’ve been working with. In this case, providing a second tone of dino-fuzz allowed for a more faithful rendition of the chosen living animal’s color scheme: the greater coucal. And it gives something for fans of both scaly and feathery T. rex fans to cheer for. As usual Permia did a fantastic job transferring the skeletal and artwork I did to a finished product, be sure to check it out! Also, don’t stray too far from the Skeletal Drawing blog - I promise not to take as long between posts. I have some quick-hitting ones on hadrosaur forelimbs and theropod lips coming up.